Last Monday, having convinced myself that a 35-hour train journey was the only way I was going to read the last four hundred pages of Anna Karenina — a course of reasoning that my abject and ongoing failure to complete the book suggests was entirely flawed, and that, after careful consideration, appears not so much a poorly conceived plan as an elaborate feat of self-deception to guarantee and prolong my failure — I boarded a sleeper at Kazansky Station and set off for the Magnetic Mountain. The journey was in two legs; first, overnight from Moscow to Samara, where I would spend a night, and then on through the Urals to Magnitogorsk, which translates roughly as Magnetic Mountain City. There are few better feelings than falling asleep on a night train bound for an unknown destination. It’s the perfect synthesis of two of my favourite activities, namely going somewhere and doing nothing. The train facilitated both, propelling me towards an untravelled world while rocking me gently to sleep, and in that blissful state I wondered whether it was possible to fall in love with a machine. 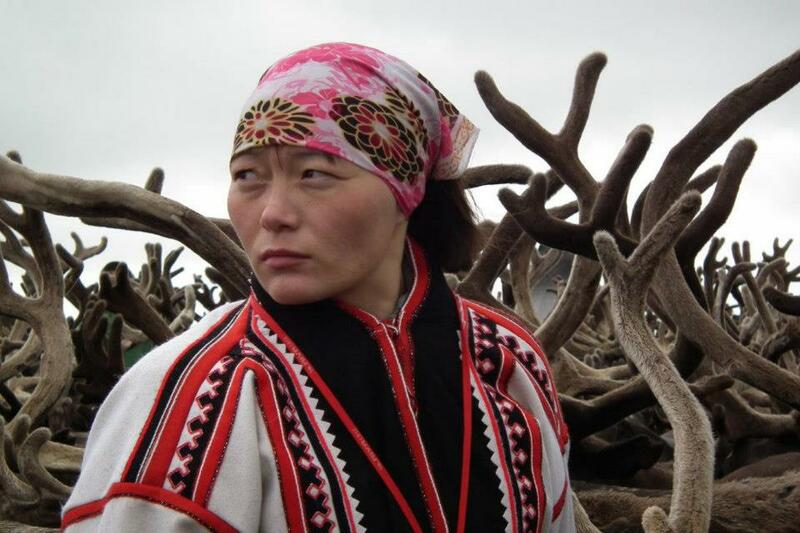 I was awoken the next morning by a soft breeze from Tatarstan blowing through the open window. Samara is famous for beautiful women, beer and space rockets, and unsurprisingly, 24 hours there wasn’t nearly enough. But the Magnetic Mountain was beckoning, and on Wednesday afternoon I climbed into my third class carriage for the 18-hour, second leg of my journey. A placard in the window confirmed my destination: Magnitka, Magnitogorsk’s nickname, but also the name of the mountain of pure iron ore, a geological anomaly, that had brought the steel industry there in the first place. I wasn’t expecting the Orient Express, but the exiguous confines of the platskart, an undivided dormitory car for about seventy people, were rendered more uncomfortable by the vast proportions and poor respiratory health of most of its occupants. My immediate neighbours were representative of the whole carriage: the elderly couple below my bunk were almost spherical, and snored in contrapuntal duet, while the shaven-headed squaddie opposite had a vicious, barking report of a cough that woke me with a start throughout the night. My romantic notions of Russian train travel were left behind in Samara; I was trundling through the Urals in a mobile hospital ward for the terminally ill. Upon arrival in Magnitogorsk the next morning I understood why my fellow passengers had had a cough; it was because they were from Magnitogorsk. I soon became aware of an unfamiliar, acrid sensation at the back of my throat, accompanied shortly afterwards by a dull but persistent headache. I’d anticipated an industrial city with a bit of smog but hadn’t bargained for an ecological disaster zone. 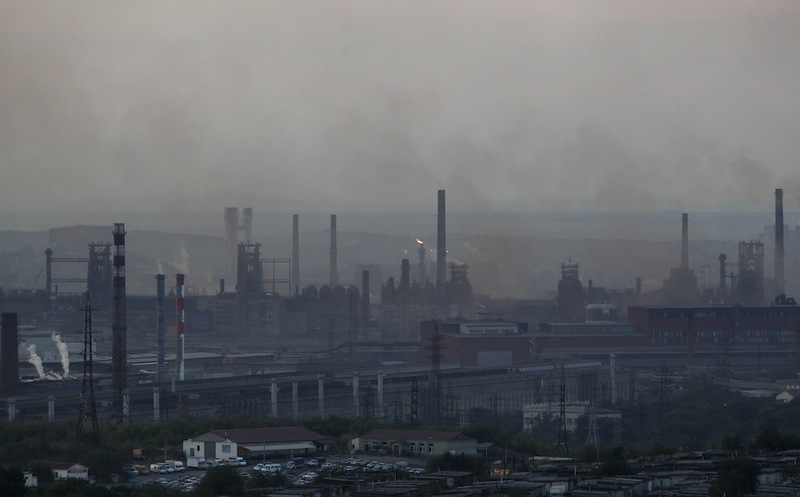 Magnitogorsk ranks as one of the most polluted places in the world, due to the sulphur, lead, heavy metals and other toxic chemicals spewed into the air day and night by the iron and steel works, built in a punishing frenzy of forced labour as part of Stalin’s Five Year Plans in the Thirties. The workers, mere cogs in the Stalinist machine, were accommodated as close as possible to, and downwind from, the steel plant, in a supposedly model (but largely inadequate) city, while the bosses lived in a separate village carefully situated to avoid the poisonous fumes carried on the prevailing winds. Since its foundation, there has always been work in Magnitogorsk, and wages there today are higher than the national average. 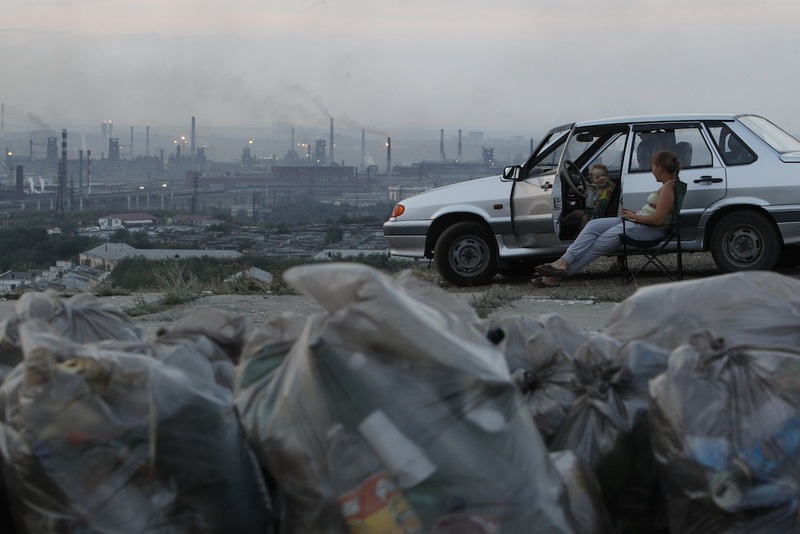 Out of a population of 420,000 people, 64,000 are employees of MMK, the semi-privatised company controlled by billionaire Viktor Rashnikov that now runs the works. But what provides a living for so many also deals them and their families a slow and premature death. The hospitals are bursting with cases of bronchial diseases and lung cancer. In winter a black crust of soot settles on the snow, and the soil is contaminated for miles around. According to local doctors, only 1% of children born there are healthy. I took a taxi through a grid system of drab and neglected tenement blocks — the city centre, apparently, although it was hard to tell. This wasn’t the sort of town that you stroll around. I had a few hours until I met the first of my two local contacts, so I went to my hotel for a much-needed nap. The concierge seemed confused by my visit. 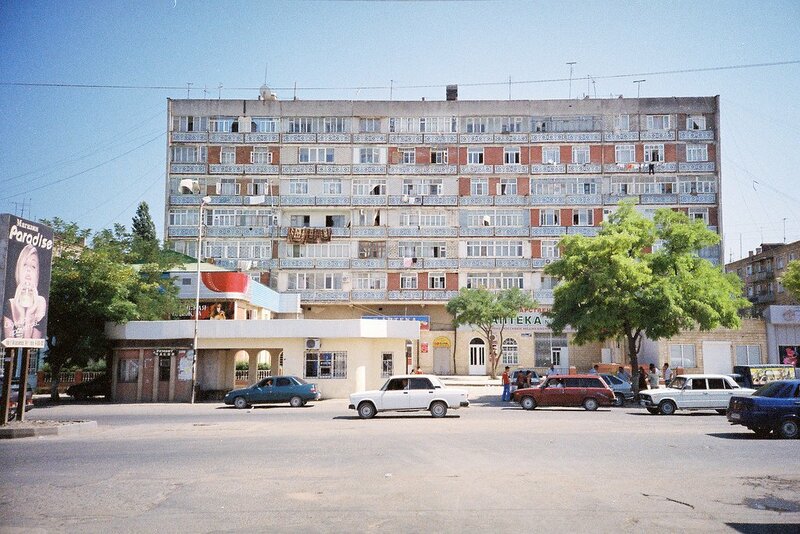 The city was closed to foreigners during the USSR, and they’re still pretty rare today. I waved my copy of Anna Karenina at her but she didn’t seem to understand. I could hardly blame her. A few hours later, Andrei and his mate Rostislav arrived to take me for a spin around town in a clapped out Lada with The Offspring blasting from the stereo. 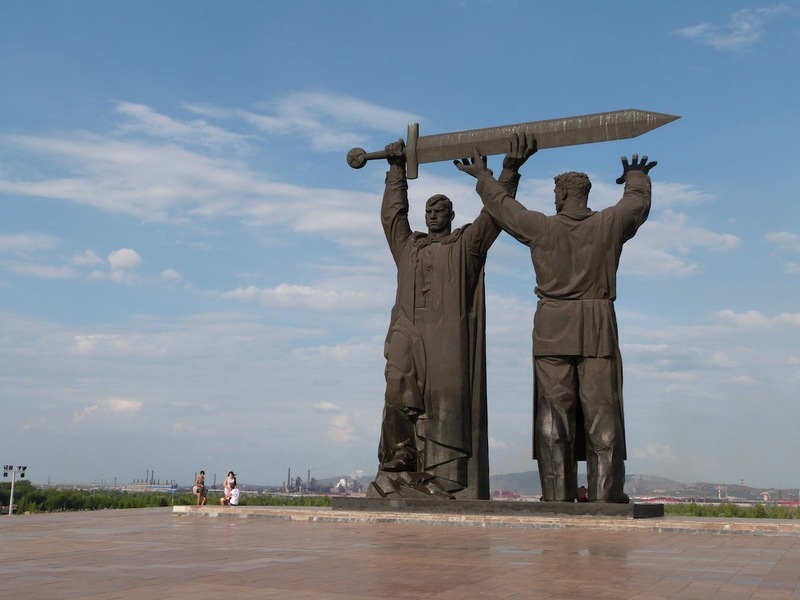 We stopped at an enormous monumental statue of a worker handing a newly forged sword to a warrior, built to commemorate the pivotal role that Magnitogorsk played during World War Two, when it produced (as local pupils are still taught) every second tank and every third shell for the Soviet war machine. 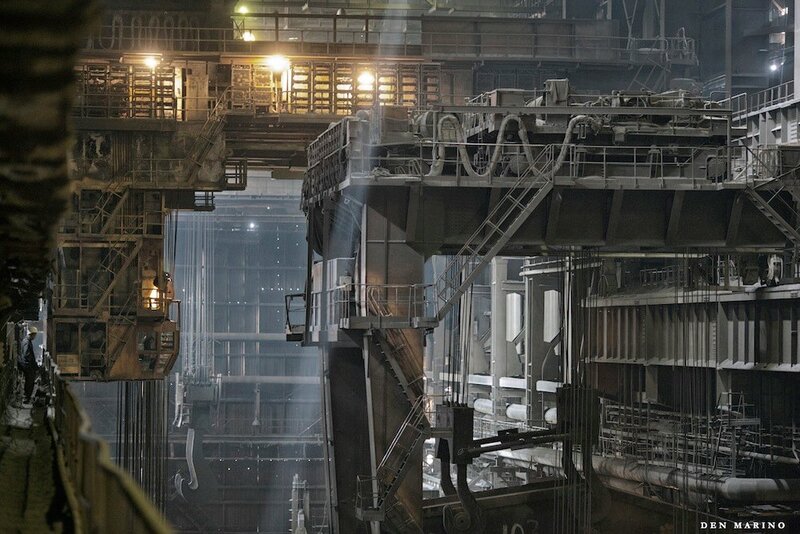 On the other side of the Ural River lay the steel works, a dreadful panorama of blackened superstructures and belching chimneys. Andrei explained that effluent from the works gets pumped directly into the river, and I was horrified to see people bathing in it. We then passed a leisure centre, ice hockey stadium and gleaming new church, all of which were built by MMK for the local population. But they still haven’t got round to putting proper filters on the factory chimneys. 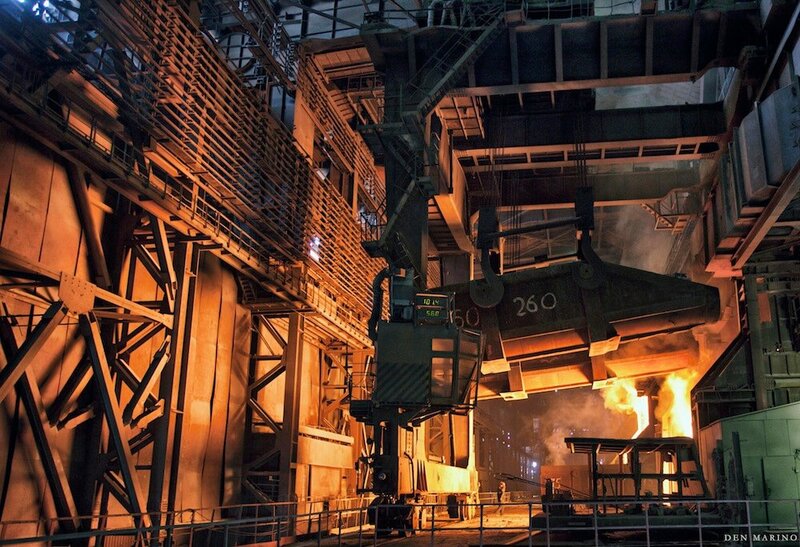 Andrei and Ros had both graduated from the State Technological University of Magnitogorsk with diplomas in the Pressure Treatment of Metals. This is the sort of degree that’s available in Magnitogorsk. The two universities in the city were established, like everything else, to serve the steelworks. Andrei had worked as a supervisor at the plant for two years, before deciding that he couldn’t take it any longer and jacking it in to pursue his bass playing. “The steelworks eats people,” he told me. Ros was a car salesman and guitarist in his spare time. We picked up their drummer, who introduced himself as Bert Molotov, and his uncle Tim, cranked up some Rage Against the Machine, and drove off into Bashkortostan to go swimming. The lake was mercifully clean. Loud guitar music and frequent road trips into the Urals were the main ways these understandably disaffected youths seemed to cope with living in Magnitogorsk. Bert Molotov was also heavily into computer games, science fiction and fantasy, and at his house later that evening he presented me with one of his own exquisitely detailed drawings, an apocalyptic vision of a huge flying metal insect destroying a city of burning skyscrapers. I asked them what locals thought of the air pollution and got mixed responses. Andrei said that most people still clung to a Soviet attitude which valued work over everything else, including health. Ros added that the pollution didn’t kill people straight away, so they ignored it. Bert quipped that it was -40ºC in winter and 40ºC in summer, so why would anyone worry about a little air pollution. We spent the night drinking beer and roaming the mostly deserted streets while the steel works blazed and roared from across the Stygian river. We stopped at the Palatka, a tent-shaped memorial to the first prisoners’ encampment established here in 1929. Before the city could even be begun, hundreds of thousands slaved incessantly in this inhospitable climate while living in tents and building the steel works with their bare hands. Around 30,000 people are said to have died in the process. My second and final evening in Magnitogorsk was spent in the company of my other contact, Pasha, who drove me around in his camper van with his girlfriend Katya and the baby-faced Alexei, who didn’t speak a word of English, but insisted on smashing high-fives and urging me to swig from a bottle of warm imitation champagne. I asked to take his photo but he wouldn’t have any of it, worried that I might be a member of Interpol. We crossed the river and Pasha scrambled the van up the side of an enormous slag heap. From the vantage point at the top we could see the glowing city, black river and livid, chemical fires of the works burning eerily in the distance as in the background of a Bosch painting. As we took in the view, Pasha informed me proudly that the River Ural was the boundary between Europe and Asia. We had just crossed into Asia, he said, and now we were looking back into Europe. It was like the Bosphorus in Istanbul, where, by the way, he’d been. I said I hadn’t been there yet. I wanted to, but I’d come here instead. Why, he asked. Why did you come here? I said maybe it was the mountain. It was magnetic; perhaps it had drawn me here. Oh no, he said. The iron ore ran out a long time ago. There’s no magnetic mountain left. This article was first published on The Junket.